While you could already disable backups completly using DisableBackup 1.0 (or the some terminal commands) and iTunes 7.7, the updated iTunes 7.7.1 includes more hidden options to configure the behavior of the iTunes Backup proccess. With iTunes 7.7.1 a hidden option was introduced to disable only automatic backups. Using the context menu for your device (as shown in the screenshot) manual backups can still be forced at any time. 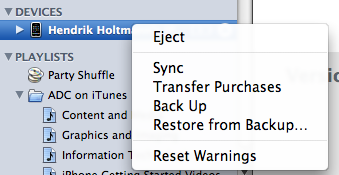 This is for sure a better option than the “disable backups completly option” available in Tunes 7.7. My small helper app DisableBackup has been updated to use this new 7.7.1 feature. You can download version 2.0 of DisableBackup here. I have written a small FREE Windows program called “iPhone Backup Switch”. The program will allow you to enable and disable the iPhone backup feature in iTunes. I have tested it pretty well in Windows XP and VISTA. There is a backup feature that will backup the iTunes configuration and let you restore a previous version, if something goes wrong. Comes complete with installer and uninstaller.